For my first birthday after beginning SheppyBrew, my beer model got me the Bewitched Red Ale w/Mellow Amber brew pack from Mr. Beer. 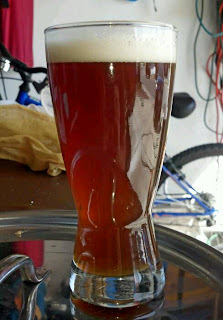 On the next Presidents' day, I used it to make Eric's Red Ale. The beer has evolved over several batches, but has always been deep-redish amber in color with a heavenly malty flavor. I have been moving it from almost no bitterness to a bit higher on the BU / GU ratio, but it is still more on the malty side of the ratio. It has always run about 5.5 % Alcohol (by volume). This was one of my favorite beers, and I had planned to make sure I had this "on tap" at all times. Unfortunately, I let myself go quite a long time without brewing it. I decided to retire Eric's Red with Mr. Beer ingredients, and make myself an all-grain recipe for this beer. I already had Quarter Life Crisis, but Eric's Red AG is less hoppy. This AG version is more of an Irish Red, although probably a bit more hop flavor and bitterness than you would usually associate with an Irish red (not by much). Batch 7 was my first all-grain batch. It used Maris Otter, Carared , Chocolate Rye Malt, and Crystal and Columbus hops. Its yeast was US05. Batch 8, was the same as 7 except is used London Ale Yeast. Batch 9, I threw in Citra hops at the 5-minute flavor / aroma addition. Not very Irish, but pretty yummy nonetheless. I tried White Labs' WLP004 Irish Ale yeast for the first time. I also decided to add a bit of chalk to bring the water calcium up to help with clarity of the beer.